What is one thing you would miss if you left Dallas? What is the one thing you would recommend to someone new to the city? Something I would recommend - getting out and exploring downtown areas. I was here a good several months before I started exploring, as most of my friends live in the burbs. Totally different feel than north of 635 I would say. Definitely a plus for a young professional. I think I would enjoy being here more, if I lived down that way. I'd miss family, the only reason we're still here. But if it just pertains to the city....I'd probably miss the safety. I feel pretty safe almost anywhere in Dallas. Maybe that's due to familiarity and also knowing where not to go. I'd also miss the wide variety of restaurants that we have. I would also suggest that new people get out and explore the downtown/uptown/north Oak Cliff areas. I have so many friends from places like Chicago and LA that put Dallas down as having nothing to do. At the same time they live in the suburbs and very rarely if ever travel down to the inter loop. I would miss the local museums in both Dallas and Fort Worth. The coziness of the Kimball, the joy that is the Nasher, The Swimming Hole at the Amon Carter, the history at Dallas Heritage Village, the wonders of both The Perot and the Fort Worth Museum of Science and History, the Meadows Museum, and all of the other museums. I love them all. I would tell visitors to check out Fair Park and all of our museums. And then eat at some of restaurants. They might be surprised. This was me.. I admit. I have not been to North Oak Cliff/Bishop Arts yet, but absolutely loved Knox Henderson and the West Village area. Totally gave me the feel of being in some of the areas near Philly where I grew up. All of my friends live in Plano or Frisco, a few in Addison.. and they don't even like going anywhere near downtown much. I would like to move down that way, but don't want to be driving to North Dallas to hang out with friends. I'm struggling with the toss up right now. Will probably just go for it and hope to make new friends down there. I also get strange looks when I say I would walk everywhere if I lived in those walkable areas. It amazes me how many Texans prefer to drive. Why don't you book a hotel room in DT for a week or so? Get the real life experience rather than just guess. I grew up in the walking cities and also sought some semblance of that here, but frankly DT has some issues. Kinda smelly, kinda dirty. Surprisingly far more concrete than most other walking cities I've visited (NY/BOS/MIA/CHI/PAR/LON). One wouldn't expect more green in NYC, but there is. A lot more. But the main problem with DT is the zombie to human ratio is a bit high. There's plenty of monsters in all my past cities, but they were usually well offset by the swarms of humans. DT to me is sorta like being the only buck in the Serengeti. It doesn't bother me by myself, but with kids in tow well .... Are you a tough chick? Uptown might be good for you though. Rent a room. Bet you'll like that. When is the last time you visited downtown? And honestly, Downtown isn't a good representation. The parts on the north portion of downtown, into Klyde Warren, McKinney Avenue and into uptown are fairly green and full of life. I speaking of literally Downtown, moreso of Uptown/West Village/Knox-Henderson/Oaklawn areas.. those are the places I have been so far. I grew up just outside of Philly and spent about 75% of my weekends actually inside Philadelphia city limits.. so I know all about what you are referring to. I honestly don't mind it, I love the city vibe and the pros and cons of it. Plenty of my friends still live in various part of Philly with kids in tow. I plan on exploring more this weekend. Maybe spend the night downtown and get a feel for it. I'm there all the time. But Uptown is not DT. Klyde Warren is nice. In fact, the nicest part of all UT/DT IMO. But it's the size of a postage stamp. Klyde Warren is IMO opinion the dividing line between UT n DT. DT is a mess. It's all concrete except on the street by the Museum. Even Klyde Warren Park's trees are just twigs. I wonder if they'll even sustain. And the grass is frequently brown not green. I'm not trying to berate. But it is what it is. Dallas has a retail shopping experience like no other. Fantastic. Downtown as charming as Westminster? Not so much. I'll give 'em credit. They ARE working on it. It's gonna take a while though. Prolly not in my lifetime. Hopefully they get an actual Trinity project going and utilize it to bring some great parks. Then it would be a great rival to some of the nicer downtown areas across the country. 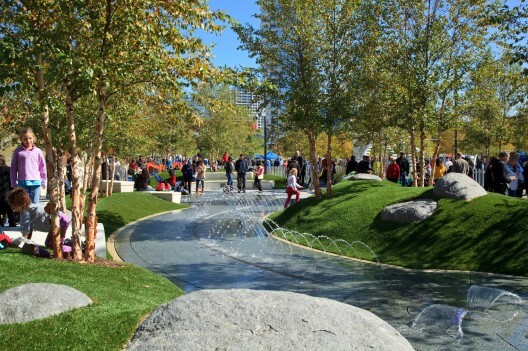 But to be fair, the picture you posted of Klyde Warren park looks to be in the winter time.